Bardiya jungle safari is one of the most popular tourist activities located on Terai part of western Nepal. Bardia National park is the largest national park covers 968 Square kilometers (374 sq mi) and most undisturbed national park of Nepal. Nepal safari Bardiya is connected the eastern bank of the Karnali River and bisected by the Babai River. There are the various category of resort in bardia nepal. Some of them are best hotel in bardia, so you can book bardia jungle resort. 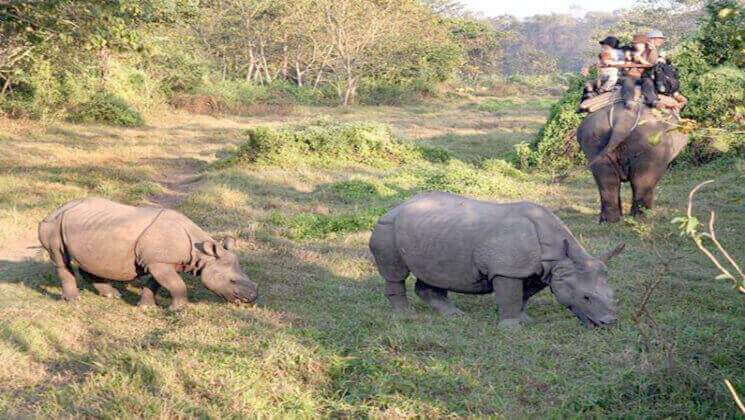 Get bardia national park map and read about the distance from kathmandu to bardia national park. Comparing to Chitwan national park, there are fewer lodges and fewer visitors because of a very hot temperature. All available resorts border the boundary of the park and various jungle/wildlife activities are possible. The resorts are built with modern facilities and arrange jungle safari activities at any time throughout the year. The park has lush sub-tropical jungles but the inhabitants of elephants, tiger, one horned rhinoceros including many rare species of birds and reptiles, thus it is a great place to do jungle safari tour. Furthermore, you will have familiarize with the vibrant Tharu life styles, their culture and tradition. Thus, remember Gokyo Treks & Expedition company for all types of jungle safari tour to make your holiday unforgettable. Winter time in Nepal but clear skies. But still beautiful time to discover wild life safari. Excellent weather, best time to explore to see animals. Monsoon season in Nepal. Thus, it is not a good idea to do any safari activities tour as the grasses are growing tall and chances to see wild animals are very less. Monsoon is over around early of September but some drops of rains still possible in September but still very nice time to discover wild life activities. 02 Nights / 03 Days safari tour program! Day 1 Arrival at Bardia National Park, transfer to the Lodge. After refreshment you will have briefing about the trip. Day 2 After Breakfast, walk for Elephant ride / Elephant back ride safari and watch animals. Visit to Crocodile Breeding Center and Tharu Cultural Museum. After your Lunch, walk for Jungle Walk, an excellent opportunity to see the wild animals, mammals, birds and rest few minutes in the tower to have the wildlife sightseeing. Day 3 After breakfast, walk for Bird Watching tour, an excellent opportunity to see rare species of birds and visit to Karnali River. After lunch, trip finish and departure to your destination. 03 Nights / 04 : jungle safari tour program! Day 1 Arrival at Bardia National Park and transferred to the Lodge, after your refreshment you will have briefing about the tour. Day 2 After breakfast, we take you to the Elephant ride safari to see wild lives into the national park. Visit Crocodile Breeding Center and Tharu Cultural Museum. After Lunch, walk for the Jungle walk, an excellent opportunity to explore wild animals, mammals, birds and rest a few minutes in the tower to have the wild sightseeing. Day 3 After breakfast, we walk for Tiger Tracking and Bird Watching, an excellent opportunity to see a Royal Bengal tiger and different species of birds. After Lunch, go for Jeep drive to explore animals. Day 4 After breakfast, walk to explore the mystical Karnali river. After lunch, program is finished and departure.